Federico Giacone is a master student in industrial management at KTH originally from Turin, Italy. He took the master level course “Challenges for emerging cities” last spring at Openlab. The course is an interdisciplinary university course, a 15 credits advanced level project course based on challenge driven innovation. During the semester he together with his team worked with Reality Lab at Stureby nursing home to improve the meal experience for elderly people. A complex and challenging task. In the course the teams learn to use the method and mindset of design thinking in order to develop solutions and innovation to a given societal challenge from one of Openlabs’ external public sector partners. With a background in production engineering Federico is used to focus on optimising processes and maximising profit. 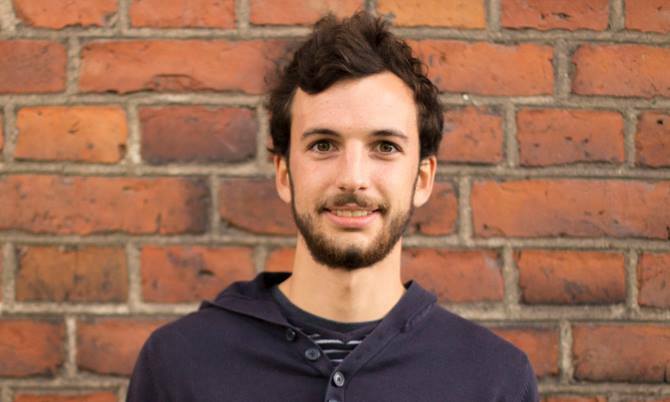 Working with challenge driven and user centered projects was unfamiliar to Federico when he started Openlab’s master’s course in 2018. – I like the optimization side and the human side as well. Working with design thinking allows you to combine both. I believe in creating something that is not only optimized from an engineering point of view but which is also user friendly. By observing the people at the nursing home their needs, actions and challenges became more clear. Important in human centered design is to work based not on assumptions but on insights about the needs of real people. – The challenge we worked with in the course was to improve the meal experience at the nursing home Stureby for people with dementia. In the beginning it was absolutely confusing. I had no idea what or why we were doing this. Mainly because I had never been working with this target group before, elderly people and also the design thinking process was new to me. But then it became a lot clearer that it was Reality Lab at Stureby nursing home who was our challenge givers as they played a more active role in the process and as we followed the method. The team found a correlation between where you dine and your appetite and mood. After building and testing a few of prototypes, some better than others, they came up with the concept called “the Dinner Dome”. A digital immersive environment where people can have their meals. The walls of the room would screen videos of a forest, a beach or some other calming nature setting. – What was the most surprising discovery for me in the empathize stage was the amount of work for the staff at the nursing home. How complex it might be for people with dementia to do the most simple things. It was my first winter in Sweden and it was frozen everywhere so the idea of creating a virtual environment for people who can’t really go places was appealing. The challenge with the project was the complexity of the problem – what is it you can actually do? It was such a broad problem. At the end it was hard not to become too emotional with the ideas the team had. – We had to discharge ideas and iterate in the process many times. When you work on something for a long time you start to develop feelings towards the thing you are working on. After the course at Openlab, Federico has been able to make use of this design thinking skills in other projects. – I used design thinking in a consultancy project last semester when we were exploring how human decision making is working in a data-driven organization. We didn’t know anything about human behavior or how an organization integrate data and artificial intelligence with human decisions. Going through the iterative design thinking process made us take decisions we otherwise wouldn’t have. For example we ended up researching the media industry. Do you want to work with challenge driven design and learn design thinking? The application for the course is now open at antagning.se. Read more about the course here.